For three years before opening the Beach Bully Restaurant, owners, Rick Waskey and Chris Merrill worked the local outdoor festivals. Starting with charcoal grills, frozen hamburgers and canned drinks, moving on to pulled pork the next year, and finally the third year smoking beef and slicing it for the now famous "Beach Bully Sandwich." 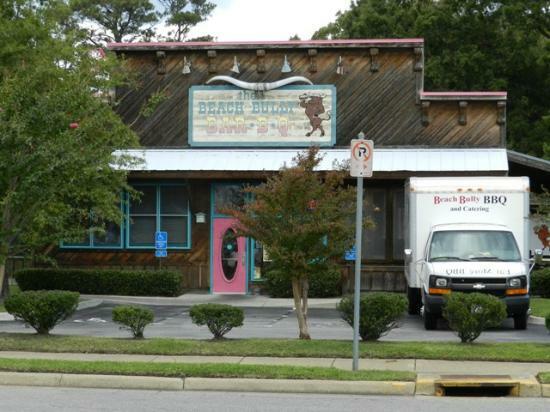 March of 1986 was the grand opening of the original Beach Bully on 31st and Baltic Ave in Virginia Beach, a small (approximately 1000 sq. ft.) rustic (pot belly stove for heat) building was a giant step in the right direction. Business (with a staff of two -- Rick and Chris) was instantly a success and almost immediately the catering business blossomed. The largest catering job, being only their second year, was for 12,000 people. The restaurant menu which started with sliced smoked beef sandwiches, french fries, chips, canned drinks, and draft beer, has grown to over 70 items. April of 1997 was the exciting grand opening of their new restaurant at the present site on 19th Street located between the Oceanfront and the Virginia Beach Convention Center. The Beach Bully Restaurant continues to thrive with a large seating capacity, an outside covered deck, and a full-time staff of over 20. It is a favorite gathering place for lunch to enjoy a sandwich, salad or BBQ ribs. Dinner has many choices in addition to the regular menu, from baked chicken, fried chicken, babyback ribs and tuna filets. Catering continues to be a huge part of Beach Bully's business, with many companies and families contining to use Beach Bully's catering service year after year. We owe our success to our many loyal, long-time customers.